I made a synthesiser module recently that used a geiger counter to control musical parameters randomly. It worked out nicely, and so the idea was refined for the Sound Check exhibition at Dublin Science Gallery, this time using a mechanically operated xylophone. 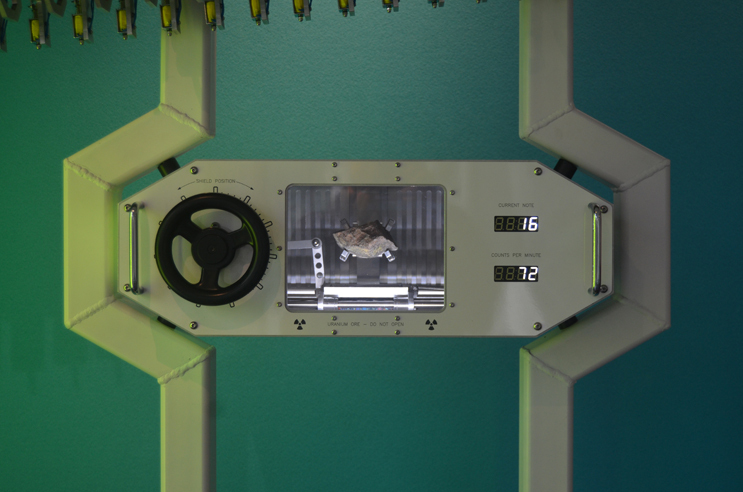 The counter was housed in an enclosure, underneath a lump of uranium ore. A handwheel could be used to move a sliding lead shield, which would cause the composition to speed up when the glass Geiger-Müller tube was exposed to the rock. 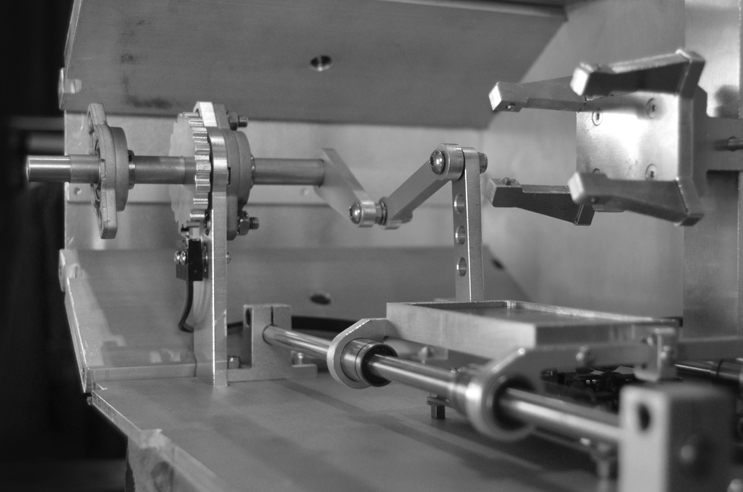 Some of the mechanisms on the bench before attaching - each one had to be slightly different to make the arc of the mallet meet the centre of the block. Getting the ore signed off by Health and Safety involved a fair amount of paperwork, but Derek at the Science Gallery was massively helpful and it all worked out in the end. There was a tense few minutes during the inspection by the radiological officer, who approached her work rather seriously, but eventually indicated her approval. The image below shows the mechanism inside the control box. As soon as the handwheel is turned, a scalloped disc activates a microswitch, alerting the sculpture to the presence of a visitor. 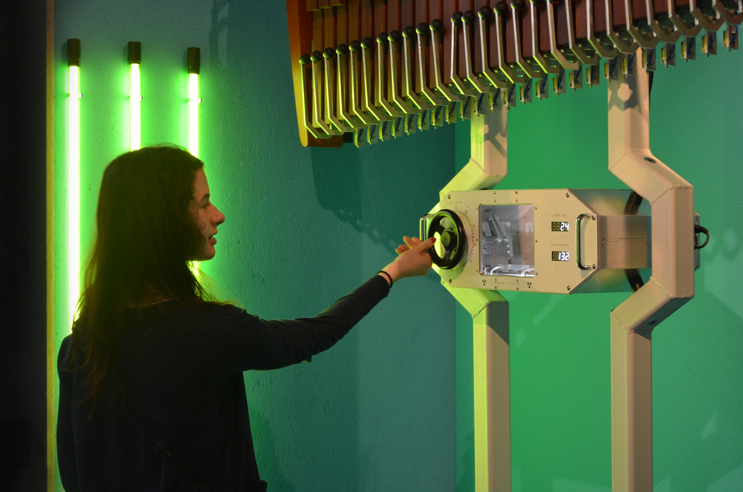 The lights fade up inside the control box, and the solenoids begin to activate the mallets. A linkage from the handwheel shaft moves a sliding carriage back and forth, which contains 6mm or so of lead. After 20 seconds of inactivity from the handwheel, the light fades down again and the music stops. 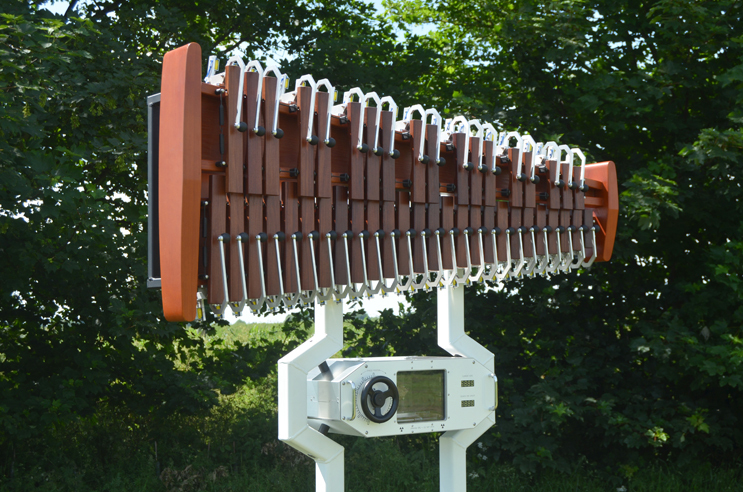 The xylophone notes are chosen by monitoring the timings of activity from the geiger counter. The green dots in the diagram below represent the detection of radiation emitted from spontaneously decaying nuclei. 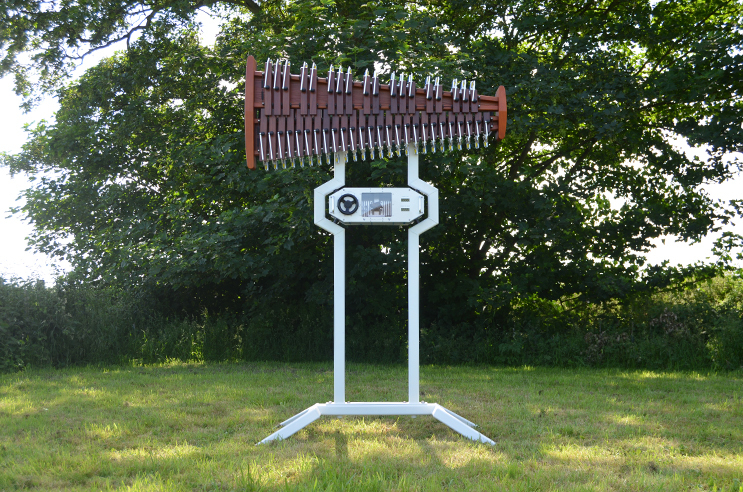 The control box takes note of three events, and then maps the time between 1 and 3 to the total range of 44 notes across the xylophone. Event 2 then determines the note to be played. When the next click from the geiger counter arrives, 2 and 4 (red lines) become the range, 3 (green arrow) becomes the note choice, and so on. 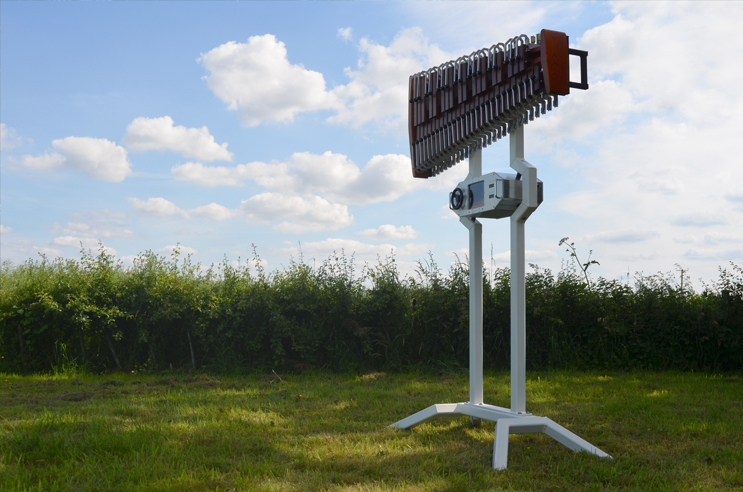 The control box sends a stream of MIDI notes to the xylophone system, which activates 44 solenoids depending on which notes arrive. It's also possible to route the MIDI cable into Ableton or whatever, or to route an external MIDI source into the xylophone. 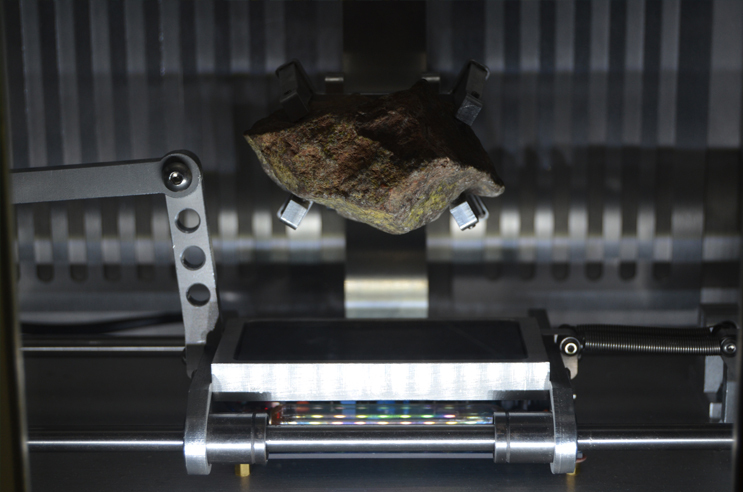 Tests had to be carried out to make sure the setup was totally safe for visitors, although in reality the ore only emits a low amount of radiation. 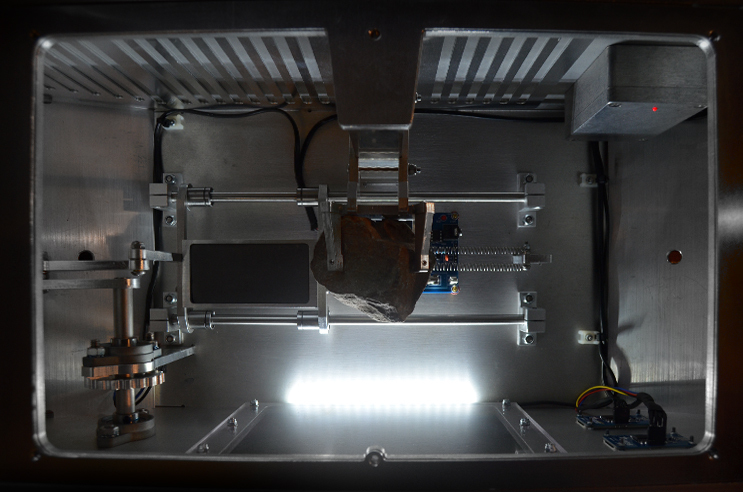 The main danger would be inhaling / ingesting dust from the rock, and so the control box was made strong enough to thwart the destructive efforts of the public. I was given a target level of 1µSvh-1 maximum measured from 100mm, which is about the same as eating a few bananas (which are naturally slightly radioactive). 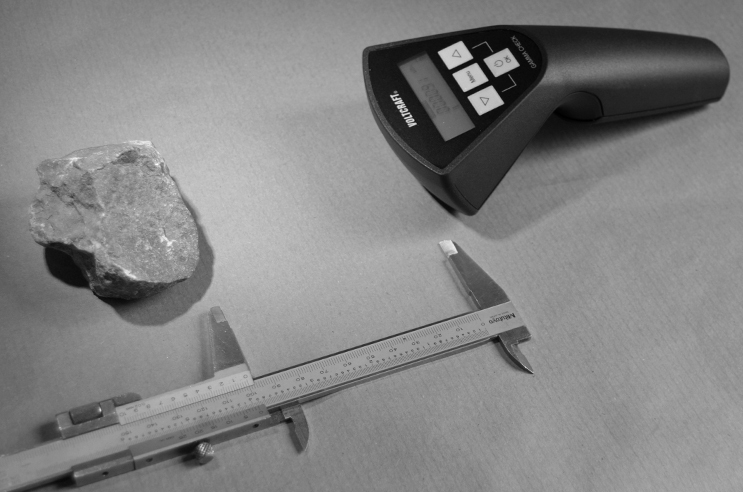 Interestingly the measurements varied considerably depending on which face of the rock was presented. The sculpture took about 4 weeks to build. To make the most of the available construction time, we drove to Dublin with a trailer at the last minute, on the overnight ferry. The other passengers were mostly morose truckers delivering tankers of corrosive chemicals. There was a storm on the way over, and the trailer was on the top deck, and so I was imagining a big wave of seawater and starfish falling out of the crate when opened, but actually it was fine. Dublin was great - I have lots of family there, and it was fantastic to catch up with everyone. There were about 20 other pieces in the Sound Check exhibition, about half of them accompanied by the artists who built them. Had some great electronics conversations with Sam Battle of "Look Mum No Computer", including an intense brain download info swap about synth PCBs that lasted about 2 hours continuously. Fascinating to compare notes with someone who had gone through a lot of the same synth building issues. 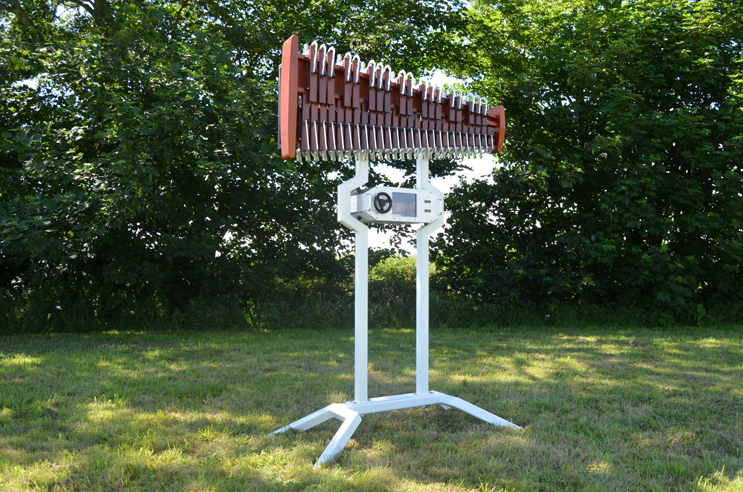 I met Brenda Hutchinson who had built a large reconfigurable microtonal music box. 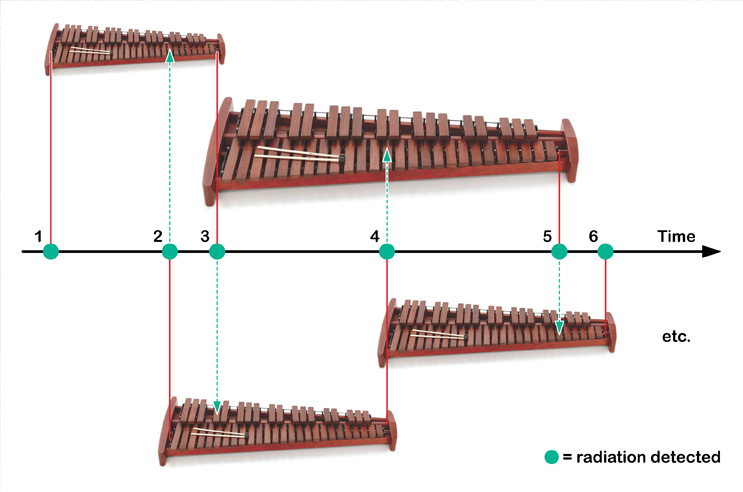 One issue I didn't fully resolve with the xylophone was the mallet hardness - the higher blocks sounded way better with harder mallets, whereas the lower notes sounded better with softer mallets. In the end I used 44 no. 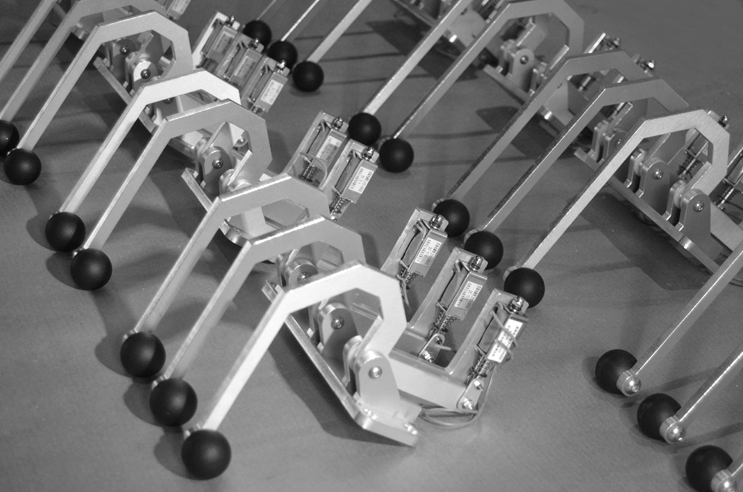 25mm diameter plastic lever balls, which were a bit too hard for the lower notes, but Brenda's machine had three different mallet hardnesses over the range of notes. Kaffe Matthews was there with a row of her Sonic Bikes. I only realised recently that she had collaborated with Eliane Radigue, of whom I am a massive fan, and who in turn actually worked with Pierre Schaeffer. I made some parts for Kaffe about 10 years ago, for the Marvelo project, which I think was the first version of the Sonic Bikes. That means I have, in the style of the Erdős number, a Schaeffer number of 3. Awesome. One of the advisers / curators for the exhibition was Nicolas Collins, whose book was a major influence on my transition from early circuit bending experiments to the next stage of practical electronics. The book explained, amongst lots of other things, how to (mis)use hex schmitt trigger chips to start making diabolical sounds, which was a great introduction to using commercially available chips for intriguing purposes. Highly recommended: "Handmade Electronic Music - The Art of Hardware Hacking". Also got to hang out and eat pizza with Chicks on Speed. Melissa - lets make those hats! 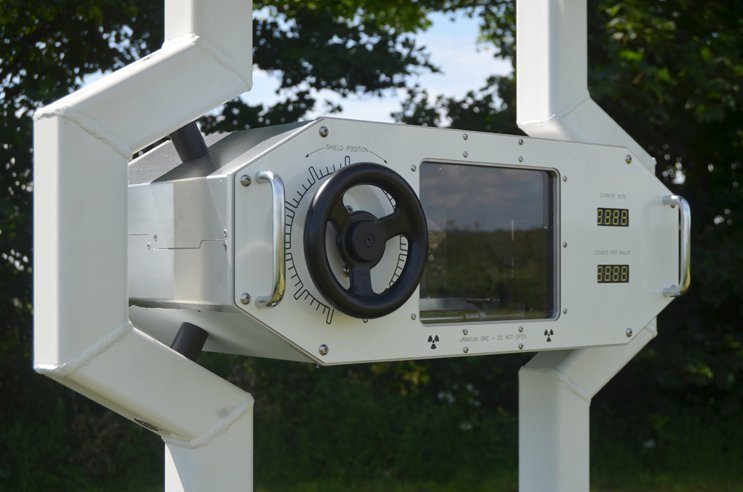 When the lead shield is in position, the geiger counter clicks away happily at a fairly sedate pace. Sometimes there's a pause of a few seconds ("What's happening?! Has it stopped working?! "), or sometimes there's a run of clicks in a single second. It's counting background radiation plus whatever makes it through the lead. Moving the shield creates a dramatic increase in activity. 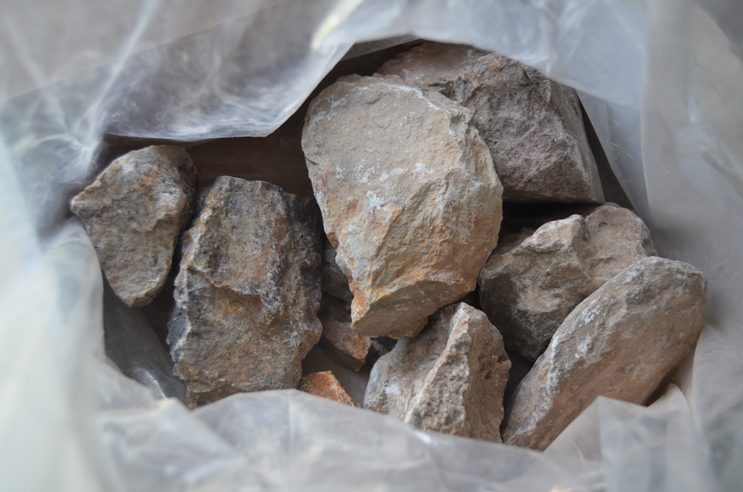 I only used one piece of ore in the sculpture, but I did buy a few Kg so that I could choose the nicest shaped rock. Placing multiple rocks right on top of the Geiger-Müller tube creates clicks fast enough that they start to sound like a constant tone. This led me to realise that there are some limits to the true randomness of the sculpture. At very high speeds, the 16MHz clock speed of the Arduino Pro Mini microprocessor will limit the resolution of events that can be detected, particularly as there are a few lines of code to process in the loop. Theoretically this should play the lowest F on the xylophone, followed by the highest C, then the lowest F again. Due to the clock speed issue, it would actually play a single central D, so there is some quantisation occurring that effects the true randomness of the sequence of notes being played. During the exhibition I chatted to Nic Collins about this, and he suggested using an analogue computer to remove the clock issue. Mechanical analogue computers use three dimensional cams and geared differentials etc. to provide a continuously variable output with a theoretically infinite resolution. This could potentially improve matters, although as the computer is made of atoms it will by necessity have some mass, and will therefore need a finite amount of time to move parts of it around, and so will still have a maximum resolution at some point. That's considering high speeds, but there is also the other end of the scale to consider. I built the sculpture on planet Earth, which is due to be swallowed up by the expanding sun in a few billion years, which may effect proceedings if this happens while the ore is still being relied upon for the source of randomness. 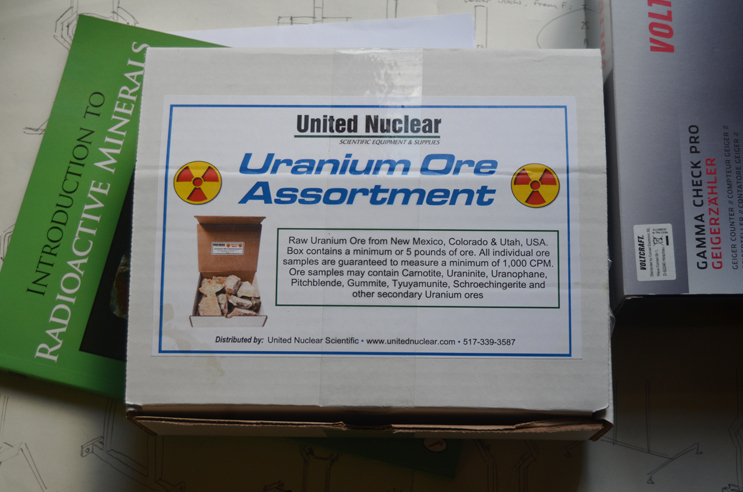 If the sculpture is safely moved to another planet, there is also the half life of the uranium to consider, and also the eventual heat death of the universe in around 10100 (100000000000000000000000000000000000000000000000000000000000000000000000000000000000000000000000000000) years. A couple of people mentioned that perhaps it is possible to predict when a nucleus will decay, but we just don't know how to do it yet. Another point that was raised was how can we prove that the sequence of notes is random. There are tests that can be applied to sequences of random numbers, but, as with someone claiming to be immortal, it seems only really possible to disprove. I have another project in mind involving chaotic audio generation, but promise the writeup won't be as long as this one. Be sure to check back in less than 10100 years. Massive thanks to Aisling, Zack, Derek, Emily, Kate, Niamh and the gang at Trinity College, Tommy and Clare and the boys for letting us stay, Mary for taking us to the seaside, and Chris for forwarding the open call submission link in the first place.